I am sure we all own our army of nail polishes from which we choose our favorite sentinels for the day or week. To help you sport some of the trendiest nail polishes this year, I am here to help. Check out these attractive shades and some recommendations from our side! This navy blue has replaced black as the hottest color of all seasons. So can nail paints lag behind? Shiny midnight blue polish worn on well groomed hands spells powerful and sassy like no other. This is a versatile color which can be carried off by many age groups and skin tones. Recos: China Glaze Midnight Mission, Lakme True Wear Nail Colour Cremes 041, Dior Blue Label and Deborah Lippmann Nail Color in Rolling in the Deep. A color that has made a huge comeback this year is the creamy beige. Instead of sheer nudes and pinkish pastels, try an opaque layer of true beige. It is universally flattering and is apt even for the most somber and formal events. Don’t forget a good top coat to enhance the color’s beauty. Recos: China Glaze Ever Glaze Extended Wear Polish in Beach Beige, MAC Studio Nail Lacquer in Sweet Potion and Dior Vernis Extreme Wear Nail Lacquer in 219 Beige Safari. Gray is brooding and mysterious, and has a certain unique appeal. If you are looking for something neutral and want to steer clear from the pinks and nudes, gray is the right pick for you. Charcoal gray brings out the strong persona in a lady. Recos: Zoya Nail Polish in Tris, OPI Nail Paint No 36 and Ciate Mini Chinchilla Nail Polish, Elle 18 Nail Pops in Shade 58 (if you don’t want to spend big bucks). Red screams hotness! Bold red nails look captivating and appealing. A classic red is always going to be a nail-color staple, no matter what season it is. Recos: Lotus Herbals Crimson Red, Colorbar Quick Finish Fearless Red and OPI Color to Diner for Nail Polish. Check out the post of best red nail paints for more suggestions. Silver coated nails never go out of fashion. The perfect accompaniment to parties and festivities, these blingy metallic nails look gorgeous and bring out the sparkle in you. Recos: Sally Hansen Diamond Strength Nail Lacquer – Silver Anniversary, OPI Push and Shove, Maybelline Color Show Silver Linings 007 and Revlon Nail Paint 415 Silver Dollar. This shade stands for all things summery and fresh. The pastel shade makes sure it is not very loud but definitely one that catches attention. 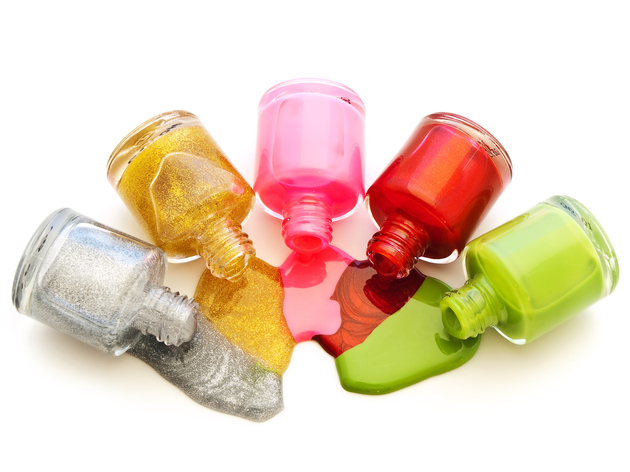 Keep your nails trimmed well and choose a color which doesn’t apply streaky for that shiny perfect finish. Recos: OPI Nail Lacquer – Gargantuan Green Grape, Sephora Green Tea Time Nail Polish, Sally Hansen Insta-Dri Jade Jump and Mint Sprint can be the end to your quest for that perfect pastel green. What’s life without a little bit of spice? Glittery top coats add fun to our nail paints; you can instantly change a simple nail paint to a gorgeous shimmery one by just applying a layer of sparkle. Recos: Colorbar Glitterati Top Coat Disco Gold and OPI Spotlight on Glitter in Blush Hour. Maybelline Color Show Gold Digger Collection nail paints (perfect for festive occasions and would be perfect for those who love bling, glitter and all that jazz).